All members of the Asian American Journalists Association, San Diego Press Club, Society of Professional Journalists and their friends are invited to celebrate the season at the fascinating Map and Atlas Museum on Fay Street in La Jolla on Thursday December 12th. As professional communicators we rely on electronic gadgets to gather and share the news, but for this year’s Holiday Party, you are encouraged to go old school for a few hours. Travel back in time and celebrate cartographers, the earliest communicators who drew maps to share information about our world. Don’t miss this chance to mingle with friends amidst 500 rare and fascinating maps at the Map and Atlas Museum of La Jolla. Enjoy a glass of wine and an array of appetizers prepared and served by Dinners by David as you wind your way through the displays depicting ancient worlds, mythological creatures, and parts unknown. 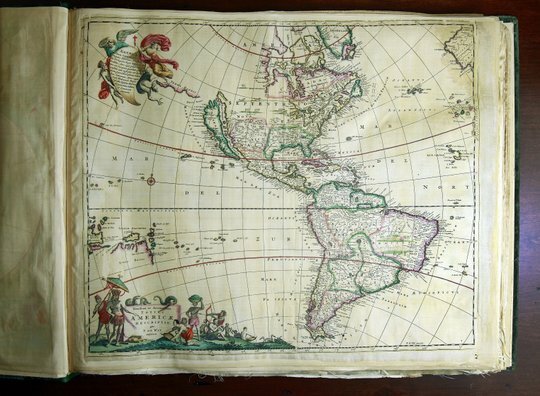 Displayed chronologically and by theme, there’s a map from 1714 that leaves the top of the world blank. Many maps have “wind heads” – human faces blowing air to show direction. Others show sea creatures with slithering tails and horned heads. There are colorful maps that show California as an island, a perception that still exists! The maps speak of history, art, fears, governments, and decisions that shaped our world and the building has won awards for its design. Parking is free under the Merrill Lynch Building if you arrive before the gates close at 6:00. Go ahead and take a ticket to get into the garage. The attendant leaves at 6 so you will not be charged.